This is a busy week for William and Mary and for me, and I want to share some of the highlights because if there is any week during the year that captures the variety of life at William and Mary for me as a student, it’s this one! Friday night I attended Dephrost, an event hosted by the brothers of the Kappa Pi chapter of Alpha Phi Alpha Fraternity in William and Mary’s Trinkle Hall. The party was a huge success and I got the opportunity to spend quality time with some of my favorite seniors prior to the start of the event. Saturday myself and six other friends traveled to Richmond for my friend’s 22nd birthday to see Girl Talk in concert at The National in Richmond. We managed to get up to the front row and rocked out reminiscent of our sophomore year when Girl Talk came to William and Mary and packed the Sadler Center full of students eager to listen to him spin some mash-ups. The National is one of just a number of amazing venues less than an hour away from William and Mary that bring in huge acts all the time. Sunday morning we traveled back to school so that I could attend the weekly business meeting of the Senior Class Gift. 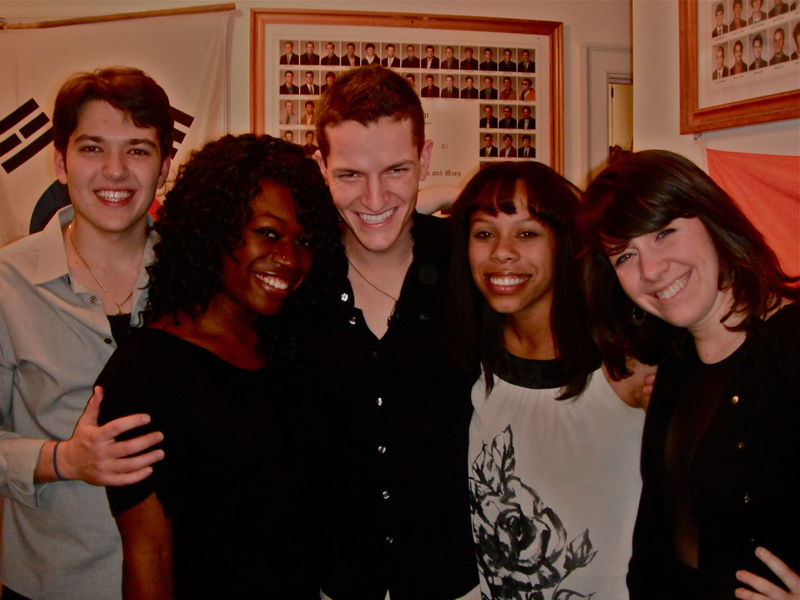 This year, it’s my privilege to be one of three co-chairs leading the Senior Class Gift effort for the Class of 2011. This semester, since it’s our last, is our big push for participation and donations back to the College so that 2011 can break all previous records and leave an impressive legacy of philanthropy. 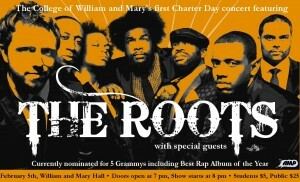 Seniors who participate in the Gift get a number of neat perks and invitations their senior year (including the potential to attend a private sound check with the Roots this coming Saturday before their concert), and can give back to a huge array of areas of the College through participation at www.wm.edu/2011. 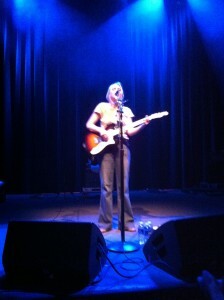 After Senior Class Gift on Sunday I drove up to Washington DC with my younger brother in my fraternity to grab dinner with my family and then to go see Lissie (http://www.lissie.com/) at one of my favorite live music venues, the unassuming 9:30 Club. 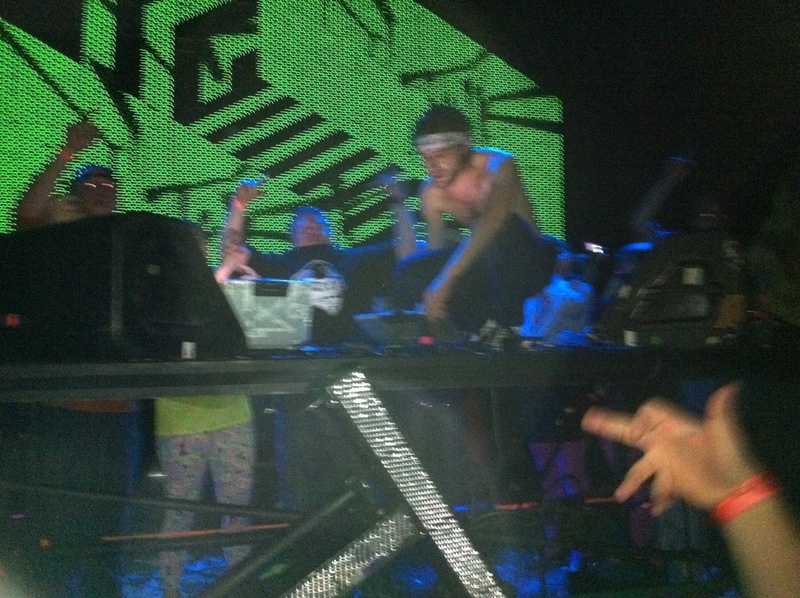 Once again, we were lucky enough to be right in front for what ended up being an amazing show from an amazing up-and-coming artist. The drive was definitely worth it, with the 9:30 Club being located just around 2.5 hours from William and Mary in Northern Washington DC. Classes are moving along and I already have two assignments due on Wednesday for my Research Methods class and my American Politics class where I have to prep for a simulation of the Hurricane Katrina disaster response as a study in federalism. My Congress and the President class has been fast-paced and exciting, with only about 12 students in the entire class. I’m definitely looking forward to the remainder of the semester. Spring rush for the William and Mary fraternity community is in full effect this week with tons of events, open houses, presentations, and gatherings as guys come out and figure out whether or not Greek life is for them. My fraternity, Beta Theta Pi (http://wmbetathetapi.celect.org/home) is hosting a number of events just like all the other fraternities this week that are a great opportunity for me as a senior to get to meet an underclassman or two who I otherwise might not have the opportunity to. William and Mary has the oldest Greek system in the United States and it’s hard to believe that as a senior this is my last rush! On Tuesday I get the chance to give my first tour of the new semester. I always love giving tours, even when it’s cold out, because it always feels great to help families and students as they look at different schools to determine whether or not William and Mary is a good fit for them. In an otherwise stressful week, giving a tour is a perfect way to hangout with a completely different group of people for an hour and a half, walk them around our beautiful campus, and tell some funny stories about life at W&M along the way! 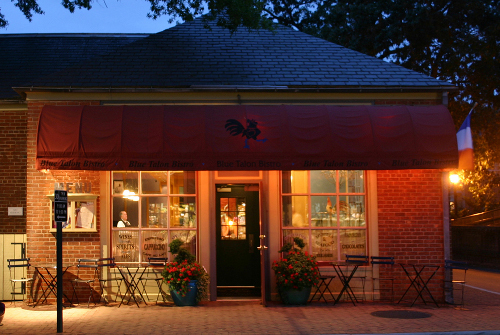 On Tuesday night I often try to go with friends to take advantage of half-price wine night at the Blue Talon, which is easily my favorite off-campus eatery located right off campus on Prince George Street. I have passed many a quiet morning before starting a busy day or week in the comforting atmosphere of this excellent bistro, which I contend has the best coffee and croissants I’ve ever tasted. 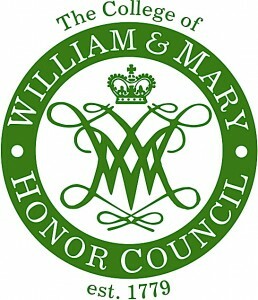 W&M Honor Council Elections begin! This week also sees the start of the elections process of the Honor Council. 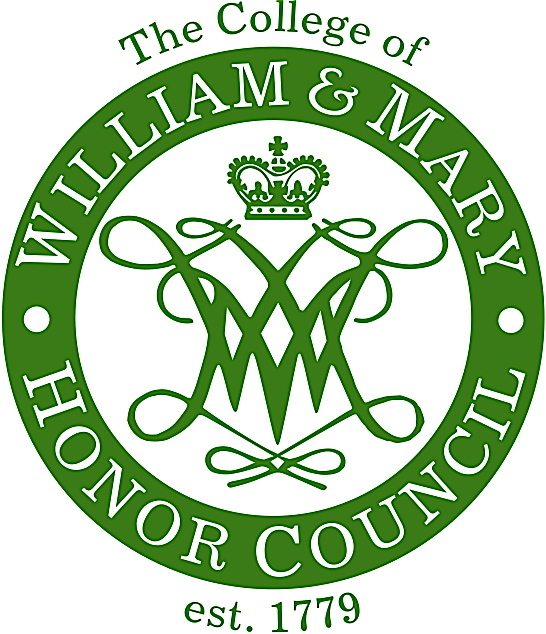 I’ve had the privilege of sitting on the College’s undergraduate Honor Council for my entire time at William and Mary and it has been one of the biggest learning experiences during my time at William and Mary. The College has the first code of honor of any school in the United States, penned by Thomas Jefferson himself and established in 1779. 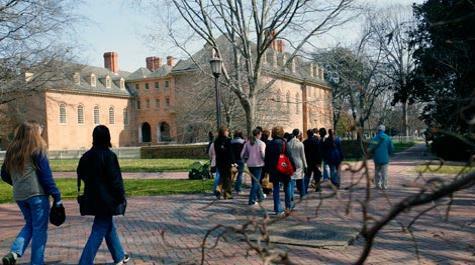 As a result, students take personal integrity very seriously and the College benefits tremendously from students pledge at the beginning of their time at William and Mary not to lie, cheat, or steal in either their academic or personal lives. Unique to the honor system at William and Mary is that it is completely student run and peer adjudicated. I’m continuing to make progress on my Senior Honors Thesis on linguistics and trademark law that I received one of W&M’s awesome Honors Fellowships for last summer (http://honorsfellowships.wm.edu/). My work is currently featured on the Honors Fellows website (http://honorsfellowships.wm.edu/2010/past-fellows/). Additionally, I am fortunate enough to have been accepted to give a presentation at the first ever Georgetown Undergraduate Linguistic Language symposium at Georgetown University (http://www7.georgetown.edu/students/gjn5/) in April! This past week I was filmed by a crew hired by the College for a video featuring a few students and their research that will be premiered at the President’s Charter Day dinner this coming Saturday evening! I continue to love the topic I’m writing about and I certainly continue to benefit from the tremendous support provided by my adviser, linguist Dr. Anne Charity Hudley. Along other academic lines, these past few weeks have been absolutely huge for me with regards to graduate school. The wait is over and since I’ve been back to school I have been blessed to have been accepted to every graduate program that I applied to! This never would have been possible without the unsurpassed support of my professors, peers, and William and Mary’s administration. 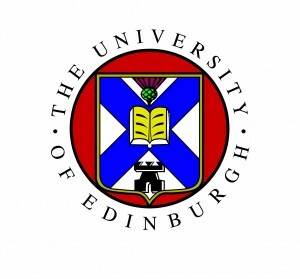 I’ve been under some stress to decide which program I’ll end up accepting and I think I’ve settled on pursuing an MSc by Research in English Language at the University of Edinburgh in Scotland. 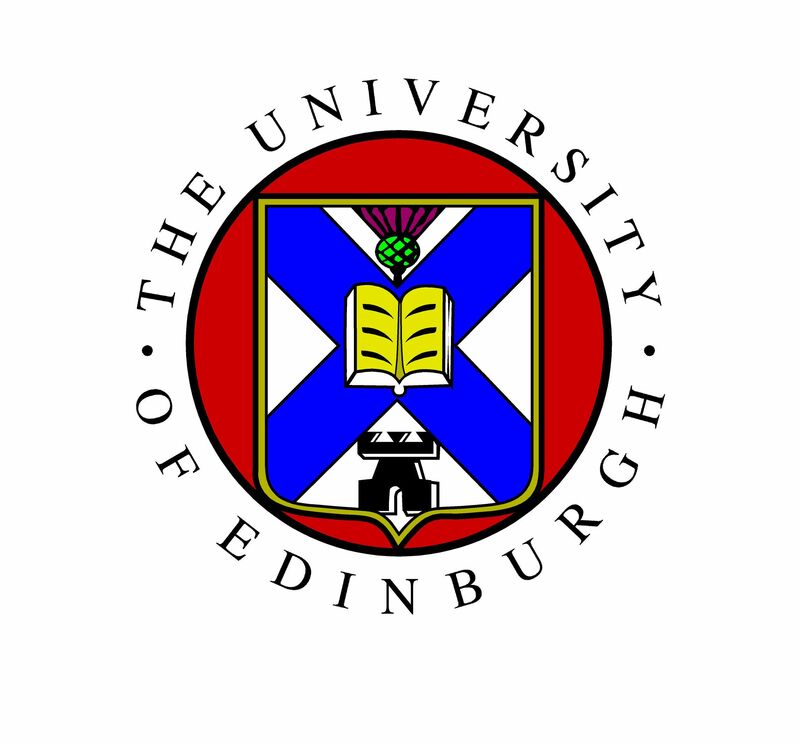 Edinburgh, even older than William and Mary, is one of the top universities in the world and has the top research program in Europe. 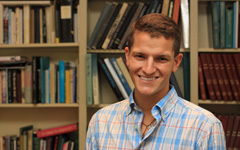 It’s a testament to the strength of William and Mary faculty like Dr. Talbot Taylor, a renowned linguistic and one of my advisers, that the faculty at Edinburgh are well aware of the rigors and strength of William and Mary’s undergraduate program, even in one of our smaller departments like linguistics. Wednesday night I’m excited to get to attend what is one of the highlights of my weeks senior spring – Senior Mug Nights hosted by the Senior Class Gift at the Green Leafe. The Leafe, a staple and basically a tradition in and of itself at William and Mary, gives great drink and appetizer deals for seniors who possess one of the exclusive purple senior class mugs by giving to the senior class gift. Mug nights are awesome opportunities to take a break from the books on a Wednesday night and go to spend some of my last weeks at William and Mary with my closest friends. On Thursday evening, the Fund for William and Mary Board of Directors arrives. It’s been an amazing experience to serve as one of three student members chosen to sit as a member of the Board of Directors. 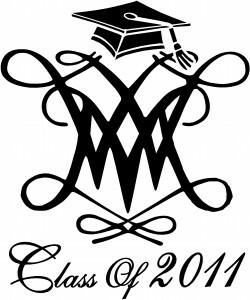 The Fund fosters and supports unrestricted giving to the College that goes to support William and Mary’s most pressing needs, including scholarships, financial aid, professorships, research, and many of the other things that allow William and Mary to remain one of the most competitive institutions in the nation. The College is hosting the Board for a dinner on Thursday night and on Friday I will attend meetings all day to get caught up on the Development efforts of the College. 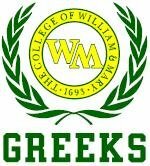 I will also be presenting on many of the student initiatives aimed at increasing lifelong relationships with William and Mary, such as the Encyclopedia TWAMPtannica (twamptannica.wm.edu) an interactive guide to the culture and traditions of the College. 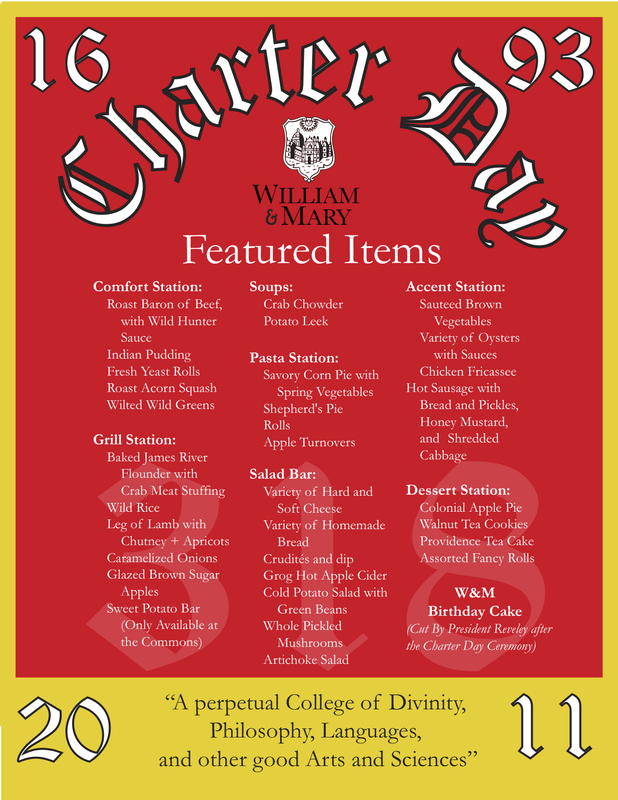 If you couldn’t tell from the size of this image, the thing I’m most excited about for the upcoming week is the College’s Charter Day celebrations. This year, just like last year, I am serving as one of two Charter Day Co-Chairs and we’ve put in a ton of work towards making the entire Charter Day weekend a huge success. In February 1693 William and Mary became the first and only U.S. college founded by royal charter, and this weekend the College celebrates it’s 318th birthday in style. 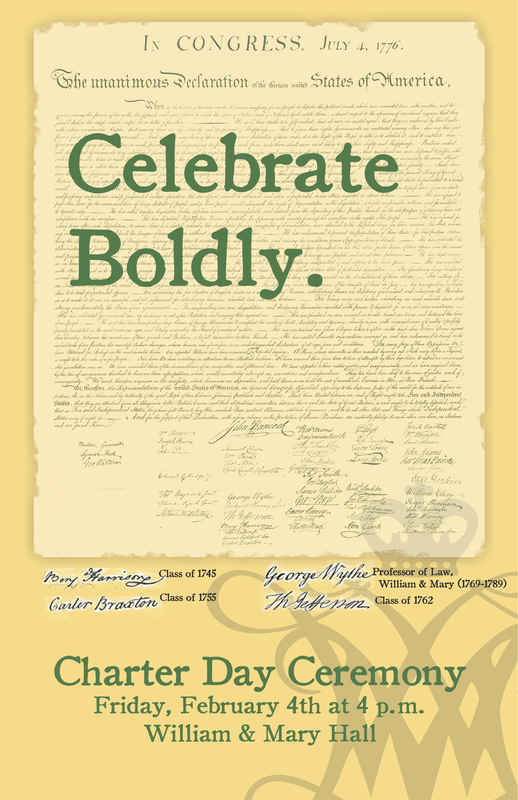 The Charter Day ceremony will be hosted at 4 p.m. this Friday at William and Mary Hall, and House Majority Leader Eric Cantor (J.D. ’88) will be helping us celebrate the heritage of this ancient school. Immediately following the ceremony the Charter Day Student Dinner will be hosted in the Commons and Sadler Center dining halls. We’ve arranged to have a jazz band play for an hour and a half in the Commons and for a string quartet to play on the raised central platform in the Sadler Center. After the ceremony, President Reveley will head over to the Commons to cut the official William and Mary birthday cake and celebrate a bit. The menu for the dinner, shown to the left, is a veritable colonial feast, and students will have access to the dinner the way they always do for any regular meal! 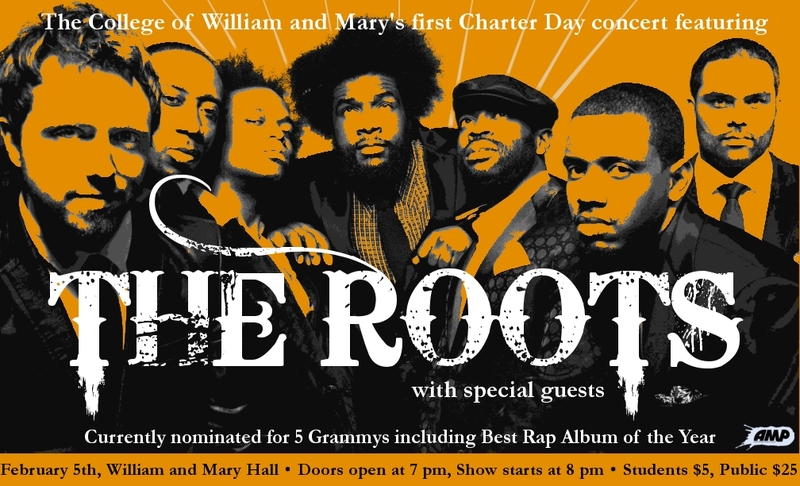 Last but not least, a lot of hard work is paying off this year in the form of the First Charter Day Concert, featuring Grammy winning, critically acclaimed hip-hop artist The Roots this Saturday, February 5th, at W&M Hall. Tickets for students are only $8, $25 for the general public. Rolling Stones calls the Roots one of the top 20 greatest live acts in the world. The concert will be an amazing way for the William and Mary community to gather to celebrate the Tribe! 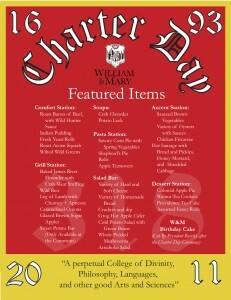 As you can see, there’s never a dull moment at William and Mary, even in February. I am continuing to make the most of the rest of my time at College and could not be more excited for the upcoming week. I love this school. Cannot wait to meet you at some of the Beta Theta Pi rush events! It’s great that with how busy you are that you are going to be making a concerted effort to support your fraternity. BOMB. Love all of this! Busy, busy bee. Love the Tribe and YOU.